Almost 5 years ago I read about minimalism in a weekend magazine and remember how the idea of living with less possessions really appealed to me. At the time I felt trapped by the life I'd created. The full-time salary. The big family home in an ideal location. The lifestyle of someone 'successful' which was just a flimsy veil masking my exhaustion. What I craved more than anything else was time. Time for myself, time for my family and time to just be. My life changed as a result of that article. Decluttering enabled me to see that living in a smaller home and on a lower income was a viable option. I realised it was my only option if I wanted more freedom in my life. There were moments when I doubted my decision and felt that my back tracking was a sign of failure. I'm glad I made that decision and listened to my heart and not my head. Now, I don't feel like I'm failing and I don't miss any of the things I've given up. In fact, I flourish more and more each day living with just a little less. My story is in Woman's Weekly this week. It was interesting to be interviewed by journalist Kate Corr and very flattering to be asked. I think the article makes some good points about the benefits of decluttering. 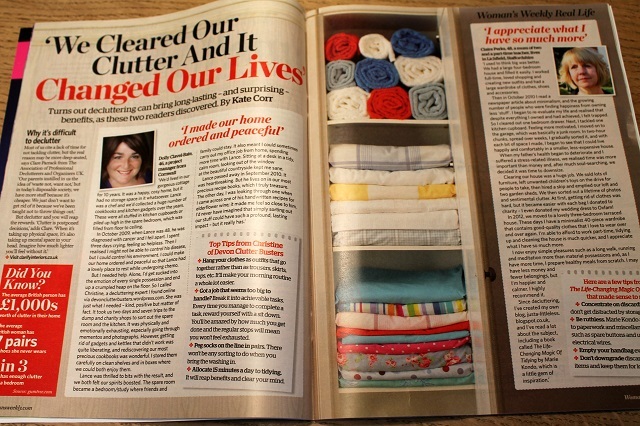 Another woman tells her story of how decluttering improved the quality of her life when her husband became seriously ill. She talks about how physically and emotionally draining it can be to declutter. Isn't it interesting that once you declutter those difficult areas of your life you become the opposite? Physically and emotionally stronger as a result. I'd never really made that simple connection before. Thank you to Woman's Weekly for interviewing me. If you get chance to read the article I hope you enjoy it. I'll look out for that, well done on getting into print. Hopefully it will inspire others to follow your example. I have slowed my sorting a bit at the moment, the pile of things waiting for car boot season is growing annoyingly large and sits glaring at me in the office. I'm glad you've found a sense of balance. It's hard to let go of things, we had a huge clear out when we moved 18 months ago… ironically it was to a bigger house but I'm keen to keep things simple and not fill the new place with 'stuff' for the sake of it. I will look out for the artical. Thanks to reading your blog I am inspired to declutter and simplify, thankyou for sharing. Congratulations on your article! You greatly inspire me. We have been on a simplifying journey since 2007 and just recently paid off our home (and have no other debt since 2007). While we watch others around us still struggle to keep up with the Joneses (it's impossible to do anyway), we have acquired something so much more valuable: peace of mind and retirement right around the corner. Decluttering played a big part of our journey in so many ways. Thank you for your blog, I love it. Well done Claire! I suspect you'll reach a whole different audience through the magazine. It's great that you're able to be so positive about such a big change in your life. Many years ago when mortgages were smaller and we at last had slightly more money each month than outgoings, over a period of time we were able to pay off our mortgage several years early. It made a massive difference, not just to us but also now to our adult children, as it has meant we're able to help them out financially in a way we would never have been able to manage otherwise. We enjoyed our camping and youth hostel holidays so much, and living simply has certainly enabled us to live better. Thanks, as ever, for such a lovely and inspiring blog. Yes, I have also been on the same quest. I have done a lot of decluttering for years because for years various family members have moved in and then left, or they have died. I thinking I am finally making headway. No older relatives in my life and my kids are unlikely to move back home. You are right. It is liberating. I will try to find the article. It's a great write-up. I struggle with de-cluttering and tend to hang onto things for no good reason whilst yearning for space and tidiness so it's an uphill battle! I read something on a blog somewhere on the internet that makes sense for me: "He who buys things he doesn't need, robs from himself". I am trying to stick by this statement in order to avoid adding to my clutter. Hi Claire, Thanks for the timely reminder! It must feel great to be 'published' although I suspect your lovely blog is probably more engaging than the magazine article (journalists have very different writing criteria). I am having one of those wobbles where you momentarily lose sight & just wonder where you should be heading...Luckily, your post has anchored me back to where my future belongs: in a simpler, Eco-minimalist world. Thank you, as always. Nikki. Hi Claire, I've just discovered your lovely blog via Womans Weekly, I also discovered the Marie Kondo book a few weeks ago via Kindle, and it is life-changing! Hi Jayne so lovely to hear from you. I've just lent my copy of Marie Kondo's book to a friend - passing the message on! I'll buy that magazine! Just read this post after your more recent one and you can see from my comment there my longing to be free of clutter. Feel like you did a few years ago at present though to be honest I do have time, just no motivation at present.